How TPEs are emerging as materials of choice for medical devices, by Ross Van Royen, Teknor Apex Company. Medical device manufacturers increasingly turn to thermoplastic elastomers (TPEs) for applications that require flexibility or rubber-like elasticity. These compounds have replaced alternative materials like thermoset rubber and PVC in standard applications like tubing, bags, pouches, drip chambers, masks, cushions, syringe tips, ventilator bags, luers, stoppers, gaskets, seals, and dropper bulbs. And as designers have come to appreciate the value of TPEs, more and more are using these elastomers for new applications. Versatility is one reason for the growth of TPEs in medical devices. TPE compounds now on the market meet a range of end-use requirements and for any given application, there may be two or more chemically different TPE types on offer by suppliers. The Medalist range of medical-grade TPEs from Teknor Apex, for example, includes compounds based on styrenic, olefinic, and vulcanizate polymers, and within each of these broad polymer families there are differing chemistries. Within this selection of TPEs, hardnesses can range from ultra-soft or gel-like to semi-rigid; optical properties can range from water clear to opaque; and there are grades available to meet most requirements for strength, low-temperature toughness, heat stability, and chemical and UV resistance. TPEs can be injection or blow moulded, multi-material- or insert-moulded, and extruded or co-extruded into film, sheet, profiles, or tubing. ● PVC. In the medical device industry, there is movement away from PVC compounds due to the phthalate plasticizers they contain. Although phthalate-free PVC compounds are available for medical applications, many medical device manufacturers are still concerned with the life cycle management of PVC and are looking for alternatives. Teknor Apex offers Medalist TPEs that can be used as alternatives to PVC in films and bags, face masks, and tubing. These TPEs exhibit the same crystal clarity and processability as flexible PVC compounds but are phthalate- and oil-free. In addition, TPEs remain flexible even at low temperatures, unlike PVC and olefinic materials, which generally stiffen and can become brittle. This becomes important for bag applications where fluids are stored at low temperatures. TPEs would better preserve the integrity of the bag, making it less susceptible to rupture. ● Latex. Medical manufacturers seek alternatives to latex due to protein allergies, concerns with the level of extractables or leachables from the cure system, and odor. Another factor is economics: Processing rubber is more laborious than processing TPEs, and TPE processing scrap is recyclable. Typical applications include extruded film and dipped anesthesia bags. ● Silicone rubber. Often silicone is over-engineered for applications which don’t require high heat resistance or low compression set at elevated temperatures. Silicone surely has its benefits, including being able to withstand multiple sterilization cycles, but for certain applications, Medalist TPEs are a more cost-effective alternative. In many cases, they offer improvements over silicone. 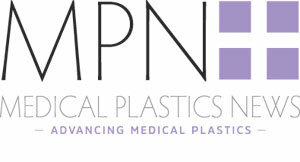 Typical applications where TPEs can be used instead of silicone are drainage tubing, bottles, and bags; peristaltic pump tubing; face mask cushions; resuscitation bags; and seals, gaskets, and diaphragms. The move to alternative materials is also taking place among TPEs themselves. For example, the device industry is seeing a shift from thermoplastic vulcanizate (TPV) elastomers to other TPEs, in particular those based on styrene block copolymers. TPVs were first to market as a replacement for rubber and became well established in many medical applications. They exhibit superior compression set at high temperatures in comparison with other TPEs. In most medical devices, however, the product is not exposed to high temperatures and TPVs are over-engineered for the application. Furthermore, at 70ºC and lower, styrenic TPEs often have a better compression set than TPVs. I like your explanation of TPVs and TPEs, and why the latter is usually preferred in medical equipment. Like you said, TPVs can withstand higher temperatures than TPEs. However, since medical equipment doesn't usually reach higher temperatures, TPEs are generally more fit for the task. Thanks for the information!